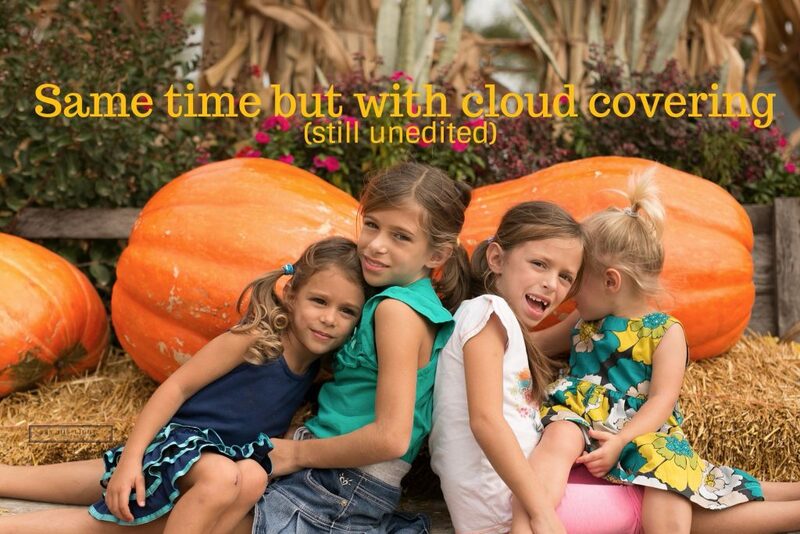 Hey mommas, I’ve had a few questions emailed to me about taking pictures at the pumpkin patch. After writing to each of you, I thought why not share the wealth? 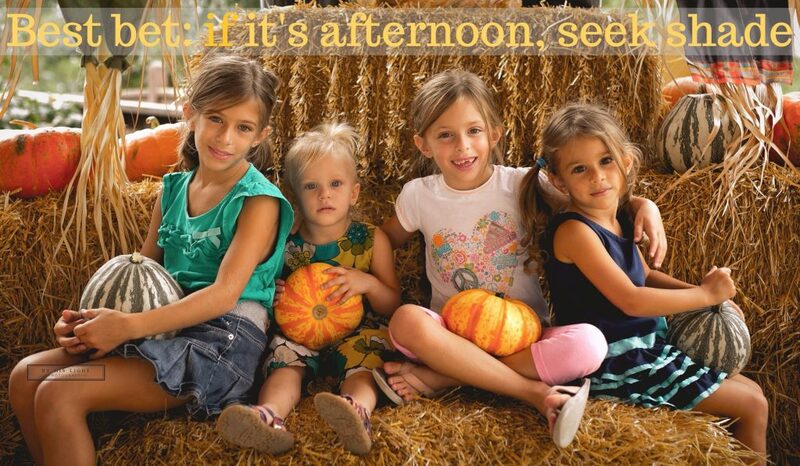 I know a lot of us are taking the kiddos to the pumpkin patch this Fall. 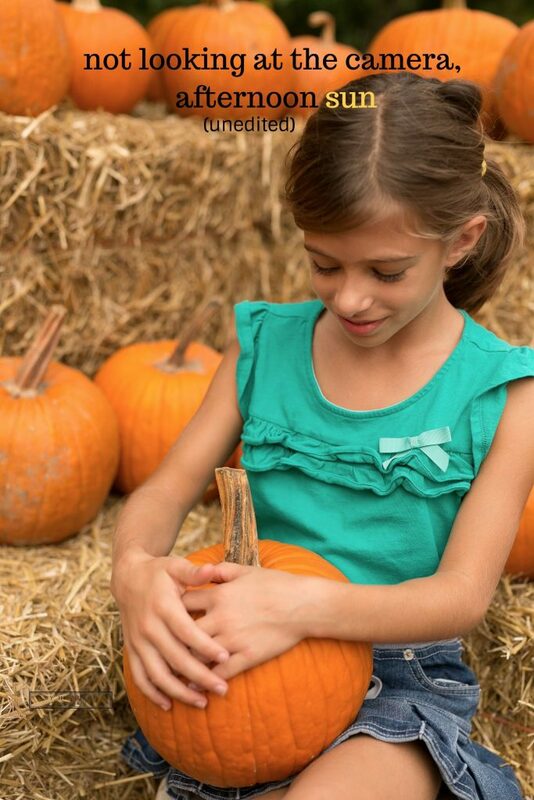 Below are a few tips for taking pictures and capturing memories at the pumpkin patch. Wait for cloud covering. Below are two images, taken maybe five minutes apart. The first image is full sun, no cloud covering, around noon. The second image is about five minutes later when clouds passed in front of the sun. Neither image has been edited; they are straight out of my camera. (Yes, I feel a bit naked posting them here… but all in the spirit of helping you learn). Blue sky day? No clouds to be seen? No problem. Seek shade. In this image we walked to the picnic area that had a roof. The sun shone in behind the girls but the roof kept it from being directly overhead and giving harsh shadows under their eyes. Finally, no shade and no roof? We can still capture the memories. Instead of asking your kiddos to smile and look at the camera, what if they looked away? This way they don’t appear to be squinting, have shadows under their eyes, and you may even catch them in a laugh! 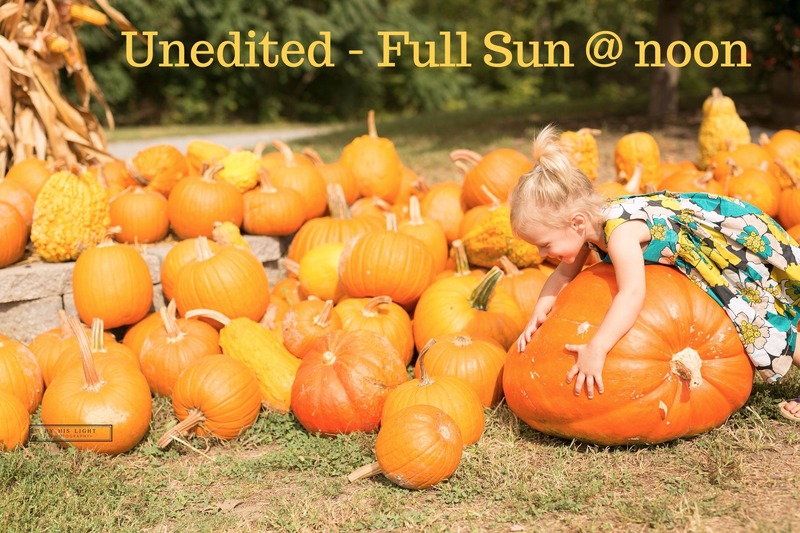 Here is my oldest daughter in full sun but looking down at her pumpkin. Still a much better image that the first one of V laying over the pumpkin! Let’s continue the conversation! What other questions or tips do you have? Comment below or contact me. Can’t wait to hear from you!